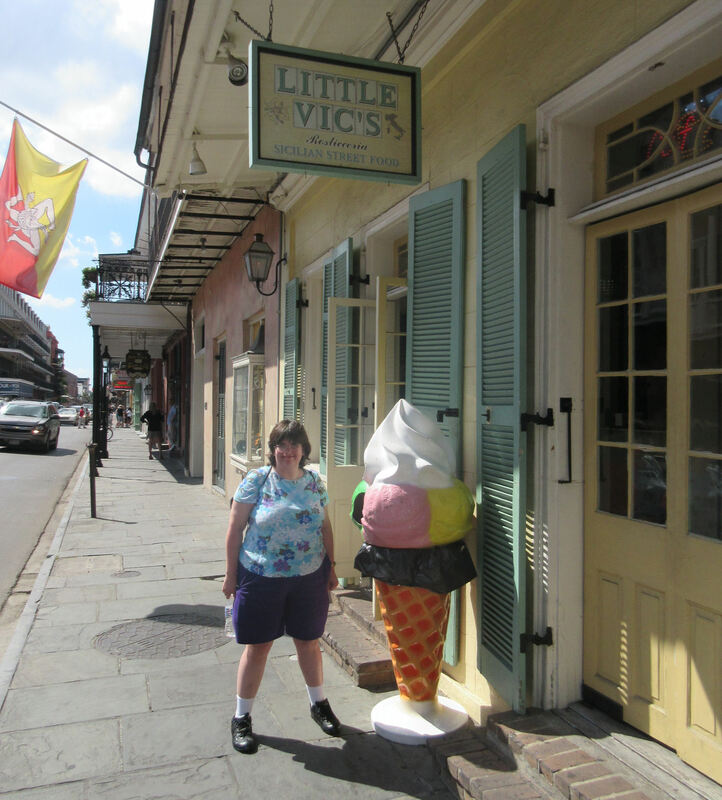 2015 Road Trip Photos #33: Do You Know What It Means to Miss New Orleans? « Midlife Crisis Crossover! 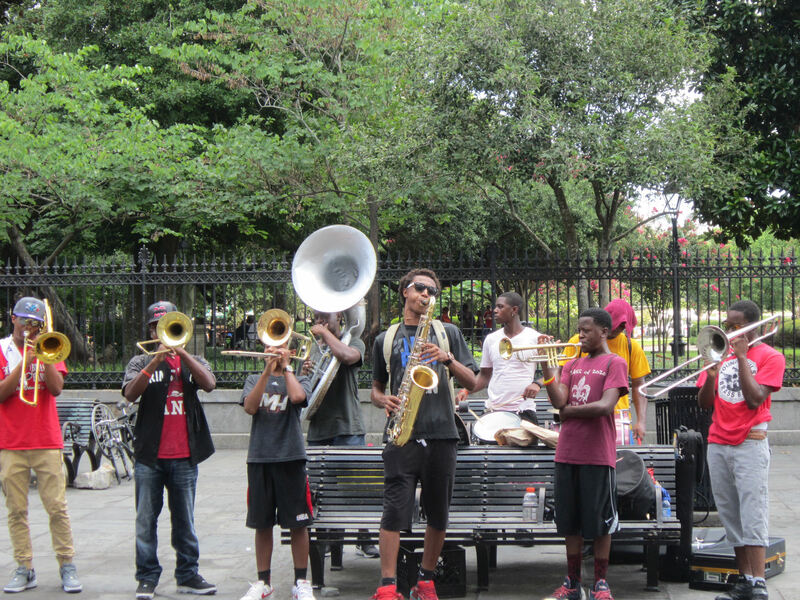 2015 Road Trip Photos #33: Do You Know What It Means to Miss New Orleans? The neon of Bourbon Street, one last time. Our final sixteen hours in New Orleans saw physically debilitating lows, frustration with the transitory nature of small businesses and mapping apps alike, a few new sights that came along at just the right time, and final encores with our favorite French Quarter sights before we bade farewell to Louisiana. After Best Lunch Ever at the French Market, after touring all the museums and the opulent Catholic church, the late afternoon of Day Four was marked with walking and walking and walking and walking and walking as we satisfied our curiosity with the contents of the north end of the French Quarter. 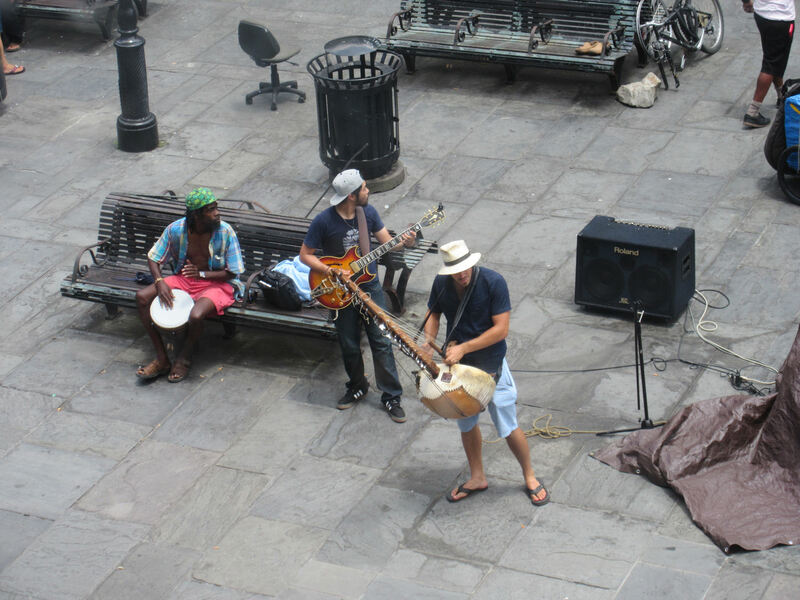 From the windows of the Cabildo, we could see new bands setting up to take the place of the morning-shift musicians. 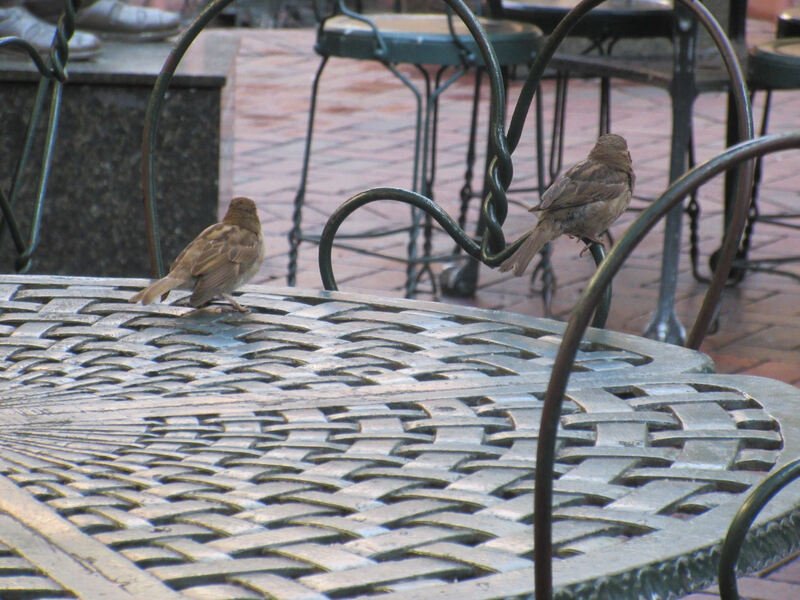 At street level it’s much easier to toss tips into their appointed containers. 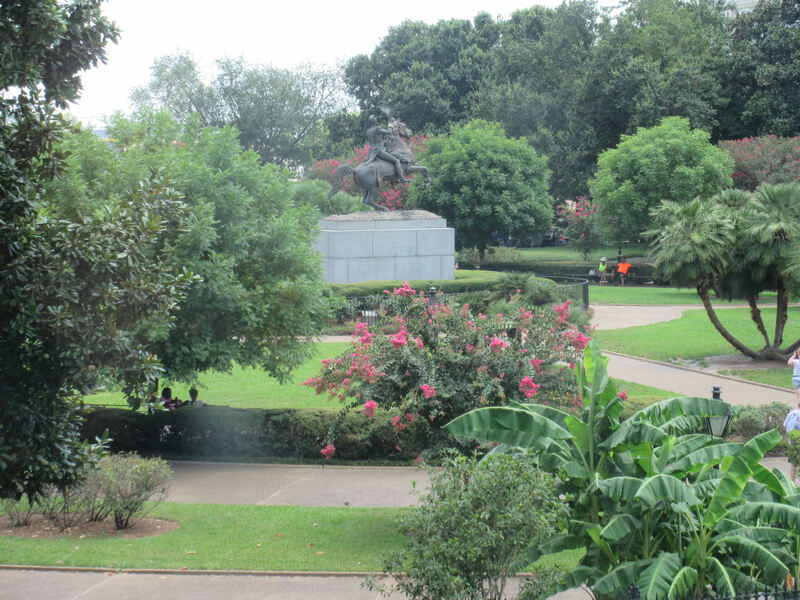 One last shot of verdant, flowery Jackson Square. 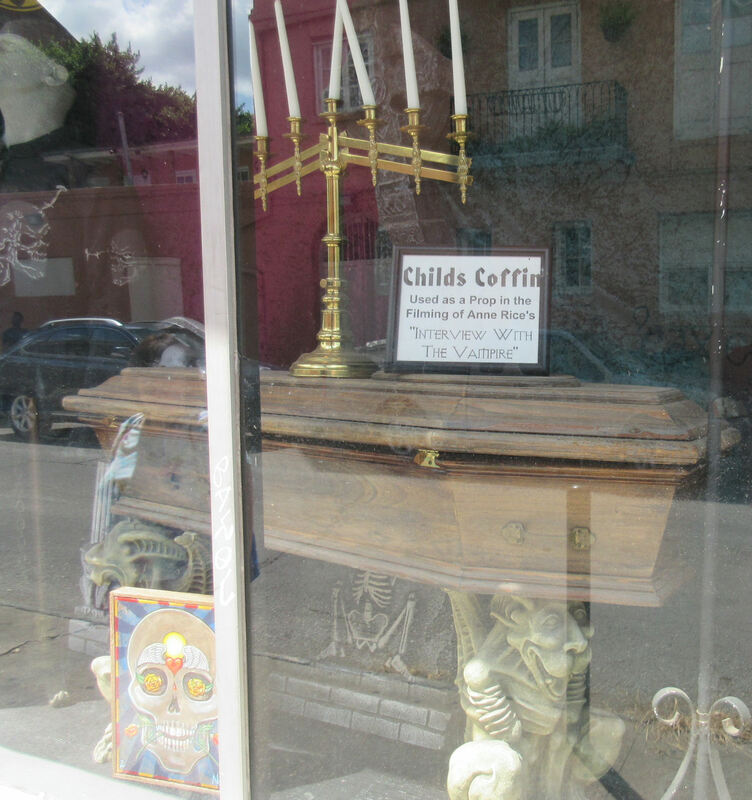 This famous movie coffin was a more interesting sight than the sad, hollowed echo chambers that greeted us on other streets. 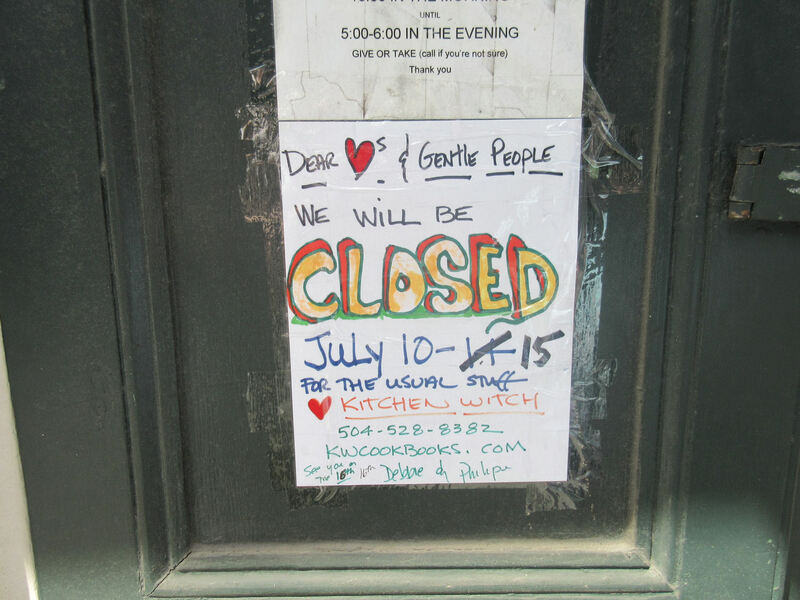 Once we got away from Jackson Square, our in-person block-by-block brick-‘n’-mortar search results turned up lots of residences, seedy joints, and empty shells where former businesses once lent their names to the ambiance. Whether it was the devastation of Hurricane Katrina in 2005, the recession of 2008, or standard marketplace attrition, all I know is something’s turned lots of places that used to be places into not-places. 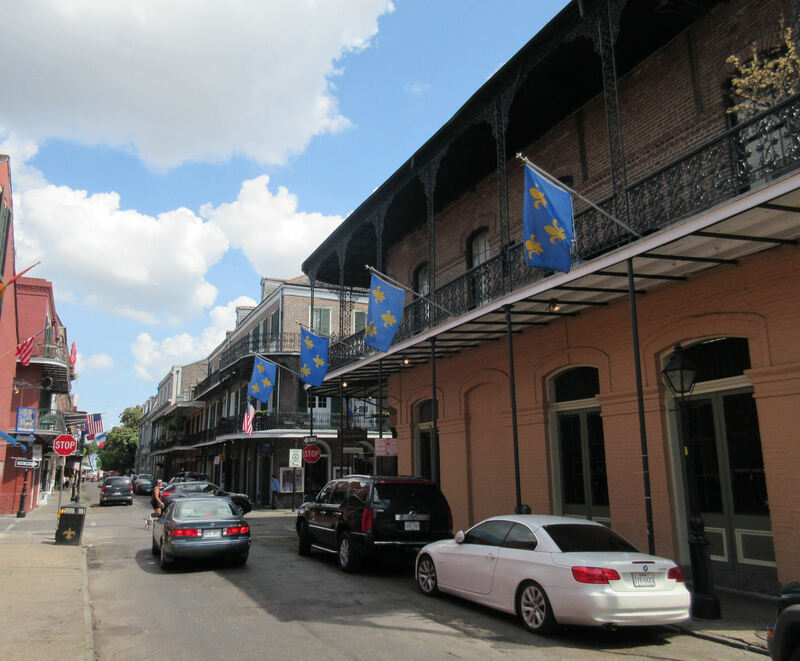 I like to think every inch of the French Quarter was bustling and thriving once upon a time. Nowadays, results vary. Random whale mural enlivens an area that felt so residential that I worried we were technically trespassing. We wouldn’t have minded so much if we weren’t risking heatstroke and desperate for shade and/or reasons to get out of the melting, punishing sunlight. Google Maps took us to ex-shops at least three times. 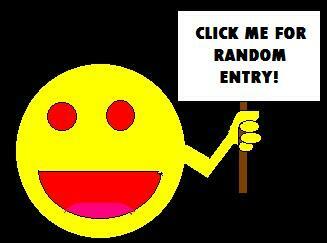 In one instance, fate pulled a cruel substitution on us. What my phone swore was an ice cream shop had at some point transformed into a post office. Anne took advantage of the unexpected to pick up postcards and stamps. but we couldn’t very well use those to mop the sweat off our brows or swallow them for moisture. — and you could practically hear the sound of screeching brakes as I mentally rewound the previous fifteen seconds and realized we’d just passed a guy holding an ice cream cone. We backtracked; Anne asked him where he got such a rarity; he pointed a block west of us. Lo and behold, we found an oasis in Little Vic’s. The front parlor of this Italian restaurant sells a variety of gelato and maybe other desserts. I don’t recall because all I know is they had frozen scoops of sugary lifeblood and it probably saved our lives, or at least redeemed some of the sunburns we’d been working up on the go. Don’t ask me what flavor this was. Maybe butter pecan or miscellaneous almond. But it was all MINE. From there I guided us directly to our hotel so we could recuperate for a while before dinner. Where Italian snacks initiated the healing process, air conditioning and soft furniture carried it to completion. Thus we built up the strength for dinner at Oceana and for one last lap around the blocks in this, our final evening in New Orleans. 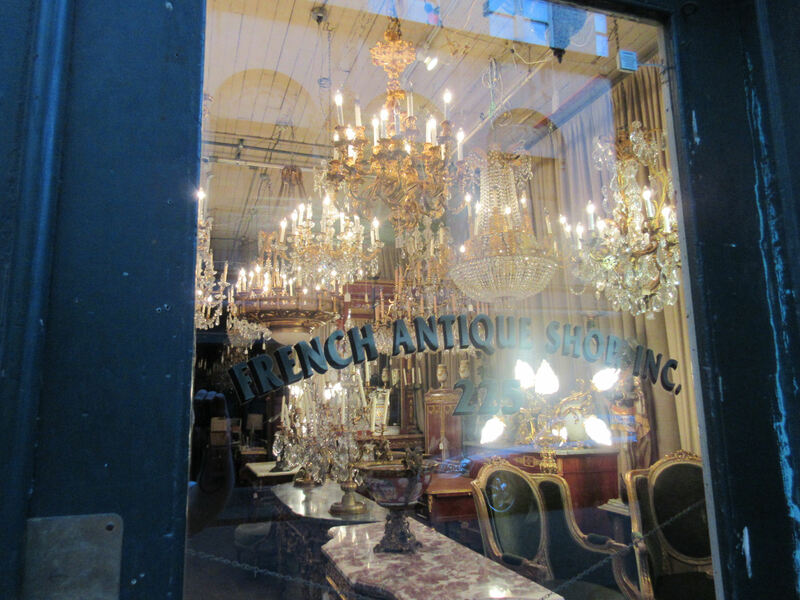 Upscale shops cluster together in the French Quarter’s southern blocks. If we were upscale shoppers. 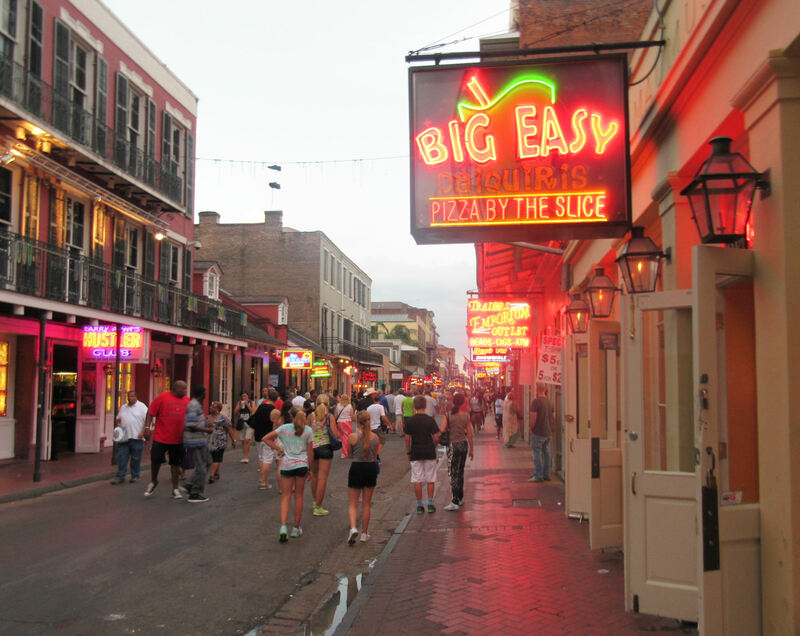 Sad trivia: there are no comic shops in the French Quarter. 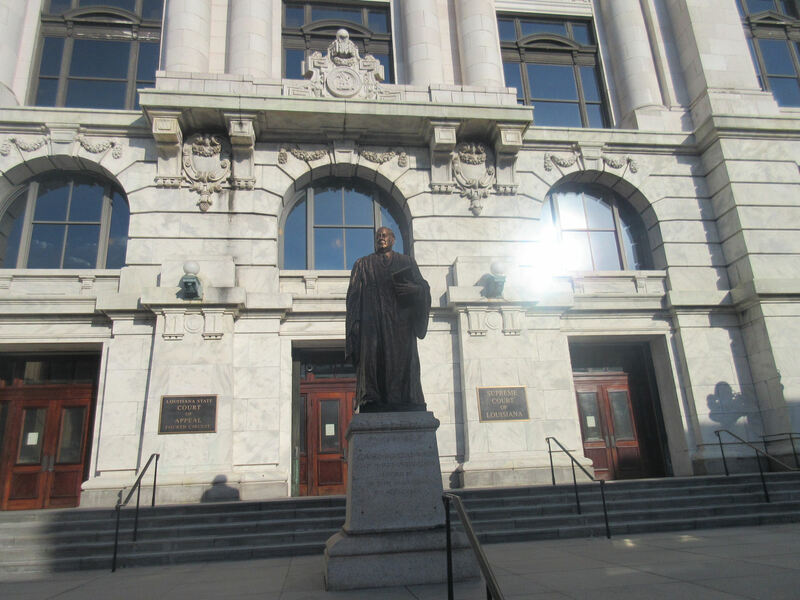 The Louisiana Court of Appeals gives us our customary architecture fix and our statue fix. 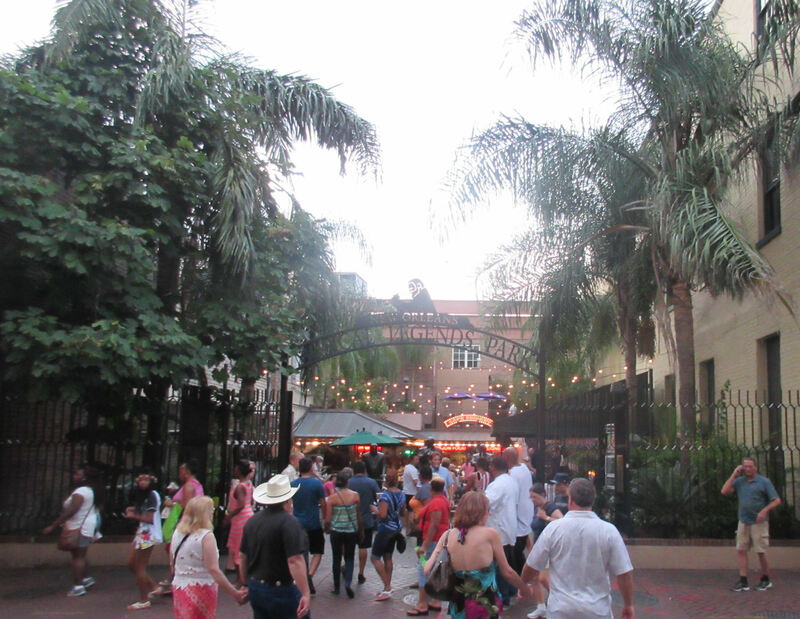 The leadoff pic of neon-bedecked Bourbon Street was probably my favorite shot from our farewell stroll. It captures the life, the energy, the commerce, the history, and the beauty of a slowly cooling, refreshing sundown. 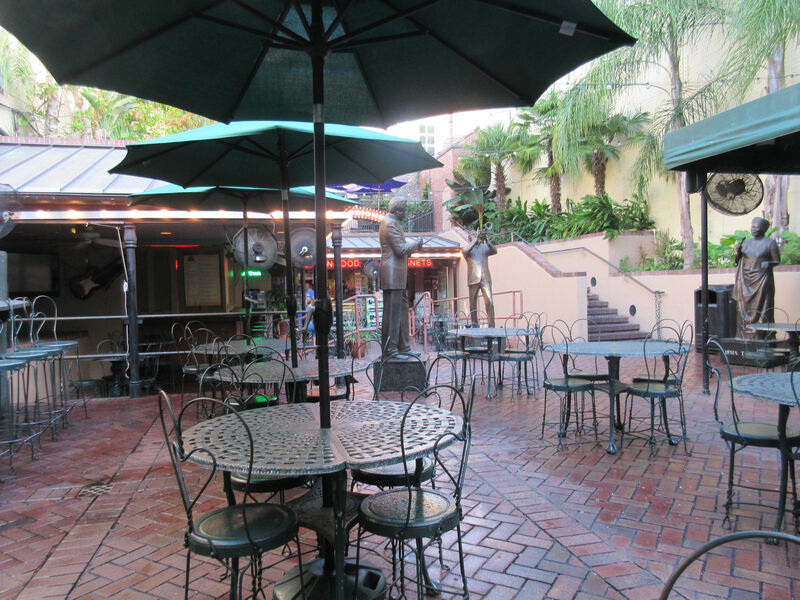 We once again passed Cafe Beignet, our old friend in live jazz. They drew a much healthier crowd at night than they had for breakfast. One good night’s sleep later, we woke up early and subjected ourselves to one last immersion into the stenches and steams of a barely tolerable French Quarter morning. 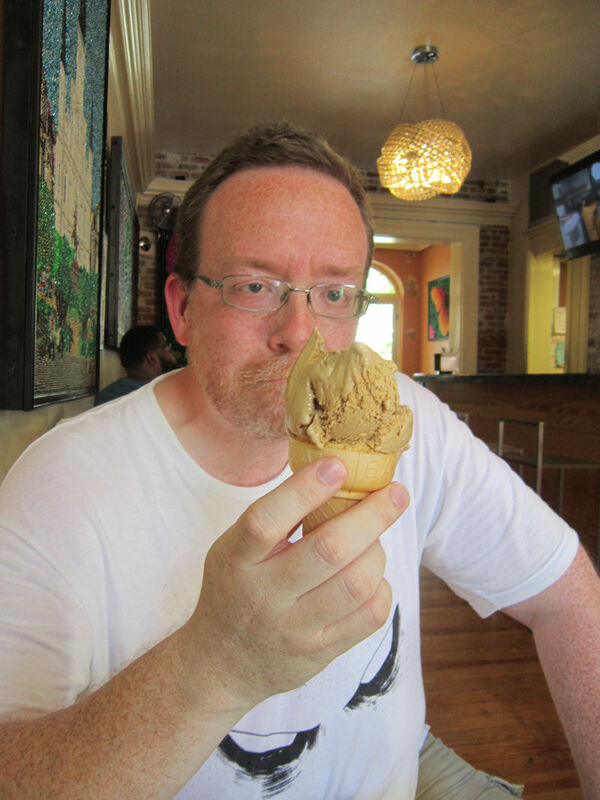 But it was worth it because I wanted to hit Cafe Beignet one last time as soon as they opened. We rather enjoy the advantages of living a life without hangovers. This time I made sure to order a beignet. This time I wasn’t disappointed. It was fresh and warm and fluffy and sugary and I didn’t have to endure a crowd of hundreds of think-alike tourists to get to it. The same jazz trio showed up and, in my mind, put on an even stronger showing than they had on Day Three. Somehow the drummer went so far as to read my mind and laid down a solo during “Bourbon Street Parade” that was like the ideal frenetic Whiplash tribute that my uncultured, drum-loving self had been secretly craving. And when we arose to take off, they played us out to “Blueberry Hill”. I couldn’t decide whether to strut or to cry over a moment so bordering on sublime. And with one last photo of that classy chandelier, we checked out of the Omni Royal Orleans, made our way back to the interstate thanks to a helpful valet, and left New Orleans and Louisiana alike. We’re not expecting a return visit anytime soon, if ever, but we carried away a lot of unique memories and a yearning for more of that cooking, if only some charitable local chef could mail some to us. History. Elegance. Air conditioning. 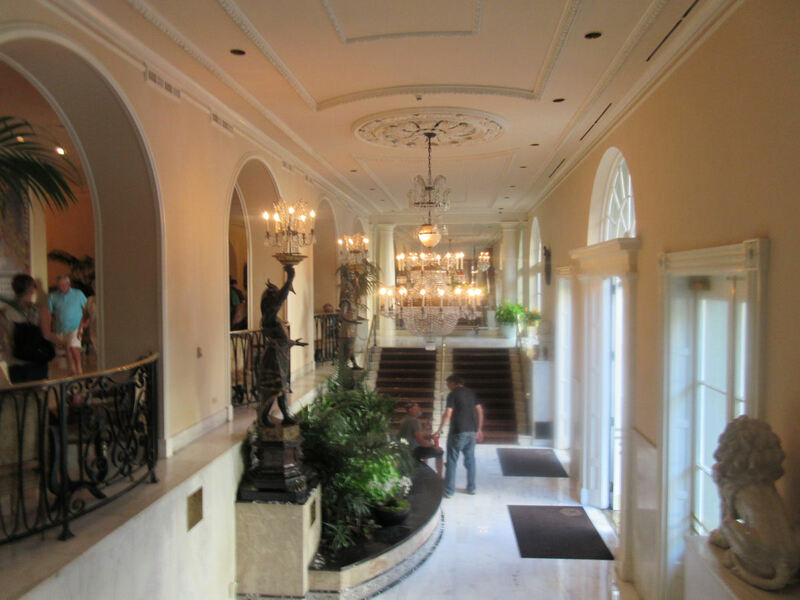 The Omni Royal Orleans has it all.